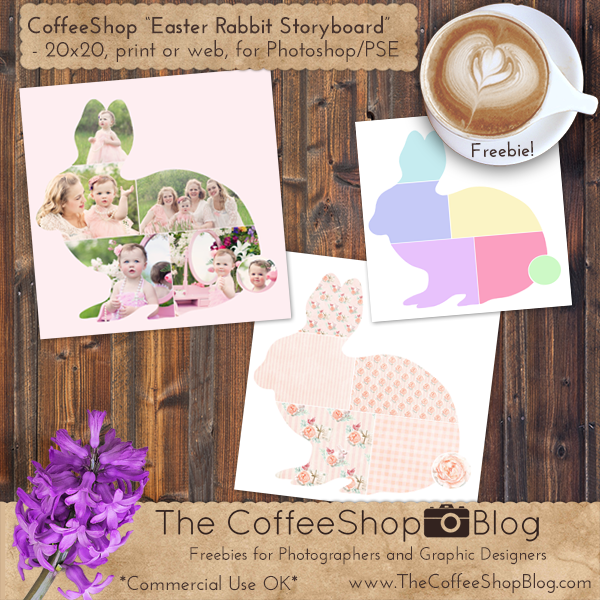 The CoffeeShop Blog: CoffeeShop "Easter Rabbit" 20x20 Storyboard! CoffeeShop "Easter Rabbit" 20x20 Storyboard! I had such a good response from my Easter Egg storyboard set that I decided to make an "Easter Rabbit" 20x20 storyboard to share with you. This Photoshop/PSE storyboard is a layered psd files so you can add your images using clipping masks (tutorial and free action). You can change the background color from white or add any pretty texture or digital paper. This storyboard is also very pretty if you add digital papers to the rabbit as shown in my example above (I used these papers). Print or post these on the web and have fun with them!!! I want to thank the talented Jill Wellington (Etsy Shop, Facebook, Blog, YouTube Videos, Pixabay) for allowing me to use her beautiful images in my example storyboard. Download the CoffeeShop "Easter Rabbit" Storyboard. I don't use story boards but I really like the idea of making that rabbit into a design using different patterned papers for a collaged bunny of sorts to use for a repeating pattern for a digi paper. Is it possible to use so that the background can be made clear so that it is strictly the bunny being saved as a png with a transparent bg? Hopefully that makes sense to you. Thanks for your help. Yes Lisa, you can just turn off the white background and save as a png file for a transparent background. So happy you can use this one!! !